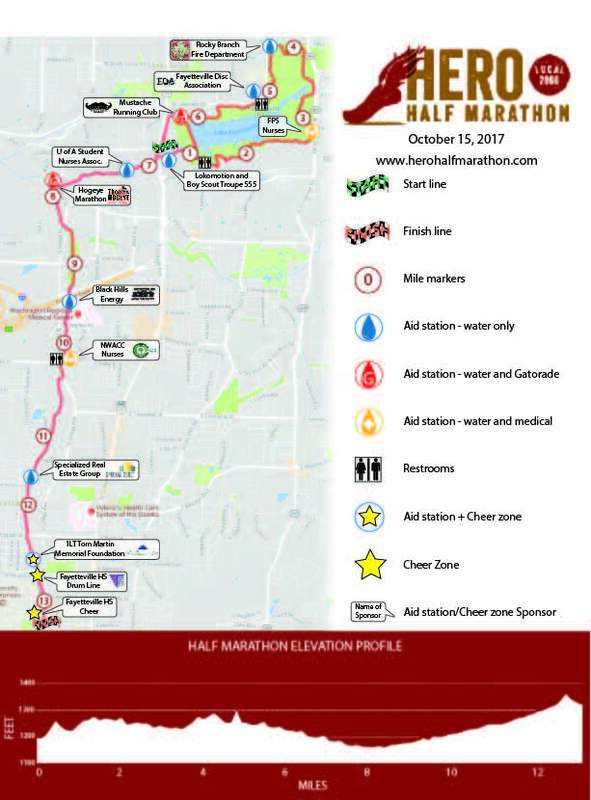 I must be up early tomorrow to catch a flight to Fayetteville Arkansas for the Hero Half Marathon. Under normal conditions I would not be traveling this far for a Half but as most of you know that follow along, I am committed to competing in the 40th Annual Running Journal Grand Prix Series. You can click on those links for more info. This is the 2nd race in the series and its been 6 weeks since the first event. I am currently 4th in the standings but hope to make a big move up this weekend. But its not going to be an easy race. The course is mostly on greenways and should be scenic through this college town in the Ozarks but this is no rail trail. This is going to be one tough hilly run with 851 feet of climb. For comparison, the NCRC Half through Umstead is about 720 feet and the Race 13.1 Raleigh is around 400ft. So, even though the training has been going well, this is not going to be a fast race. But everyone has to run the same hills so the most important thing and the reason I am going is for placing and points. 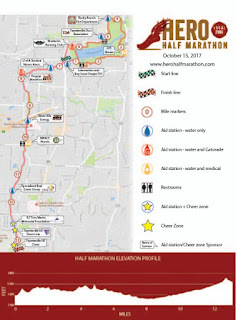 Here is the course map and Elevation chart. Mile 8 to 12.8 looks like a LOT of fun. And mixed in there are several really short steep ones. Speaking of training, things have been going quite well despite the late summer like weather we have continued to have over most of the past 6 weeks. My mileage is still lower than my normal but adequate at 31, 30, 35, and 32 miles for the past 4 weeks with some good quality in the mix. And the yoga continues to go quite well. I'm still averaging about 4 to 5 Bikram classes and 6 yin classes per week or about 12.5 to 14 hours of yoga a week ! Not much in the way of other cross training now with not much extra time plus I tweaked a shoulder two weeks ago. So that's it for now. Stay Tuned for hopefully an exciting race report in a few days !